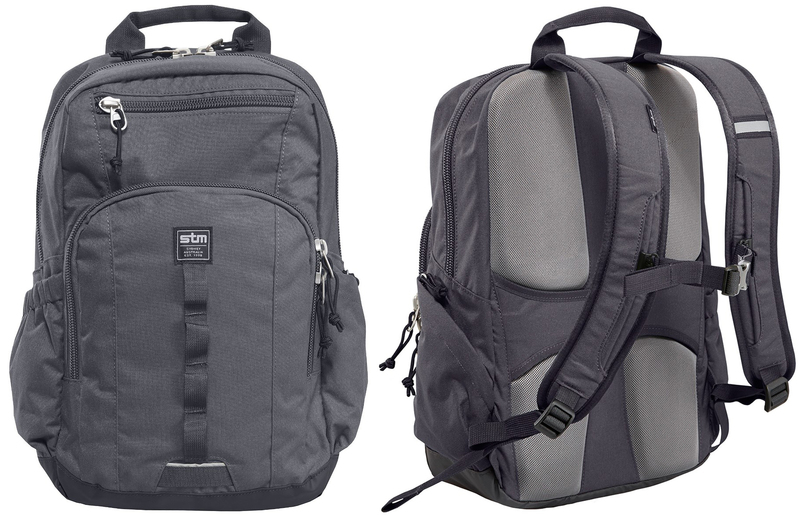 A small laptop backpack designed for travel, but does its size make it difficult to love? A good design with great build quality, designed to make traveling with a laptop or tablet easier. The bag itself is small, meaning that it will only for if you have a small laptop or tablet to carry with you. Unfortunately missing the TSA laptop pouch. If you travel a lot with a smaller laptop or tablet, like something in the Surface family, this could be a good alternative to a traditional laptop bag. For the most part, the design of the bag is good. The main compartment is large and spacious, considering the overall side of the bag itself. The small top pouch is a good size for keys or a charging cable, or even a small battery pack. The front pouch is where things start to get good. Inside of this zippered pouch is another zippered pouch. This is great in an airport or on the plane, as a place to secure easily lost or stolen items because of the difficulty of reaching these items. In addition, a tight strap around the back allows you to easily connect the backpack to rolling luggage, making travel through an airport far easier. A small zippered pocket on the side works for change and other small items. One area that could use some work is the elastic side pocket, which is often used for water and soda bottles, is a little too small to be used for that. While the pocket itself is mostly big enough for its purpose, the opening makes it difficult to get the bottle in or out. The overall build of this bag is superb. The seams are all well-stitched, neither the zipper teeth nor pull are made of cheap plastic and the fabric itself is thick. The material used to make the top handle, luggage strap and shoulder straps is secured well to the body and has just a little bit of stretch to it, which should help maintain the health of the stitching. The only part of the bag that appears to be of concern is the back strap. The clip that connects the two sides does not appear to be made of the same material as the zipper pulls, but instead of a cheap plastic. The straps connect to the shoulder straps with a pair of sliding connectors, which are equally unimpressive in quality. They are also held on, seemingly by magic which will certainly not stand the test of time. The bag does what it is designed for well, but it is not perfect. One feature that would make it closer to perfect would be a TSA-approved quick-open back panel. Most of the backpacks we have with a focus on computers all have a back section that folds open to prevent having to disassemble your bag for TSA screening. Instead, you open the back and remove the laptop from its own, private compartment. This bag, however, has the laptop compartment inside of the main compartment, meaning that you will have to dig past other things to get the laptop out at screening. This is unfortunate for a bag otherwise hyper focused on travel amenities. Unfortunately, while the space is well used, the bag itself is too small overall. It is designed to accommodate an 11-14 inch laptop, but the type of person traveling with a laptop is often not bringing a small one with them. While it is capable of carrying a Surface Pro easily, it is too small for any of the laptops we have in the office, and too small for any of the non-tablet computers we have in our extended group. Assuming the bag is within your size requirements, though, it is important to know that the weight is a bit disproportionately heavy. This added weight, however, is not enough of an issue to be terribly noticeable when it is full of equipment. The bag is definitely designed for a specific size laptop, but the size it is designed for is a niche market. Fortunately, that niche is growing with the popularity of the Surface line and its competitors. Before considering this bag, you would want to measure your computer and ensure it is going to fit into the main pouch. You'll also want to carefully consider what else you're carrying with you, as you will find additional space limited for larger items.